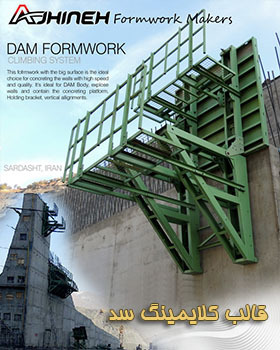 Ajhineh Formwork makers Company is one of the most successful companies in the field of construction of steel concrete and steel structures in Iran. This honour is the result of the team's creative and committed team as well as the trust of our customers. 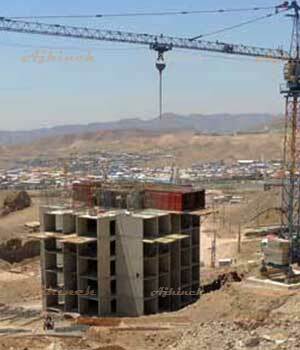 The unique design method of the project in the implementation of projects and the presence of high-quality creativity in the design of concrete steel formworks has been a significant development of the complex during its 10-year period. After gaining great titles and honours in the past years, we hope that we will be able to earn more honours by serving our dearest country and are waiting for your loved ones. 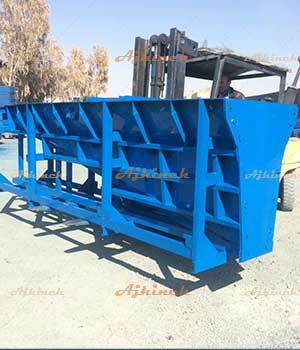 Designing custom formworks tailored to your project needs brings to you the design and technical engineering team of Ajhineh, providing creative ideas for speed and cost savings. 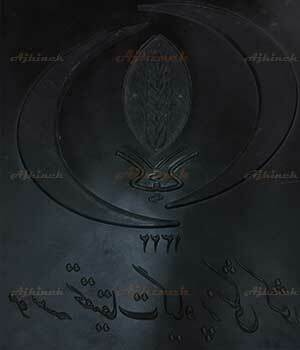 If you need special templates, you can use the free consultation of the Ajhineh Team. Estimating the cost of the mold and knowing the size of the mold and the way layout templates is the most important step in calculating the cost of the contractor. But to run these calculations, you need a designer, an appropriate calculator and guide. The alarm can be a surefire guide for you to run your gigantic project. 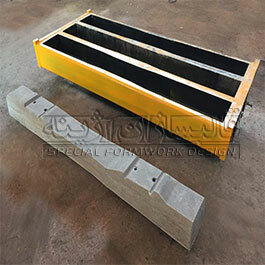 Supply of consumable parts of railway sleeper formwork is always the most important problem for the production managers of this sector. With a CNC automatic hank opener machine and CNC cutter, each cutting speed of 6 seconds, with a precision cutting far superior to European machine ones, it has taken a major step in the self-sufficiency of the rail industry in the field of sleeper production. 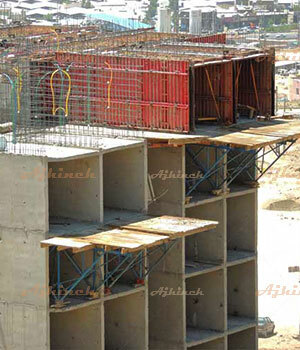 Using the technology of the world in designing and manufacturing concrete formworks, the mass production of prefabricated concrete has been produced in such products as sleepers and T-beam, joists and slabs for the Ajhineh. 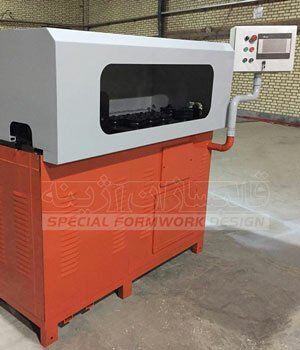 Precision molds with accuracy of up to 0.1 mm and long life-spans make use of the high quality waterproof colors and materials used to justify the purchase of these formworks. 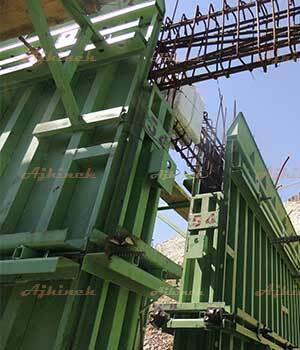 Along with the massive railway sleeper manufacturers, especially in new products, such as the 30-ton sleepers, the Ajhineh Company has produced 7 and 8 mm Pc-wire automatic necking machine and achieving the shortest production time among European neck machines. 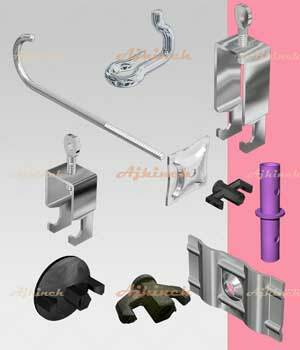 It makes it easy to achieve self-sufficiency in the traversing industry. 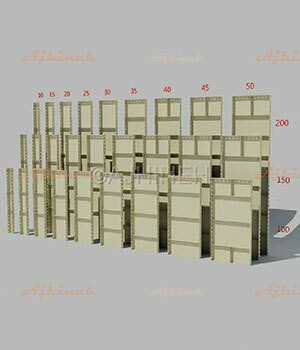 Concrete steel formworks are used for panels that are standardized in three sizes: 1, 1.5, 2 meter in length and 10, 15, 20, 25, 30, 35, 40, 45 and 50 cm in width. 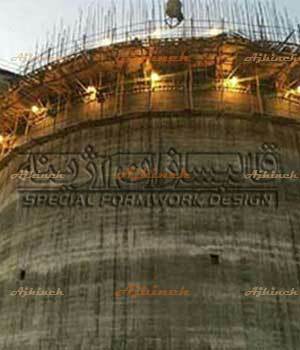 welded steel formworks are used for one sided wall, double wall, foundation and ceiling. Concrete formworks is manufactured in two standard sizes of 5 cm and 6 cm edges, and according to the requirements of the project, one of these two standard products is selected. 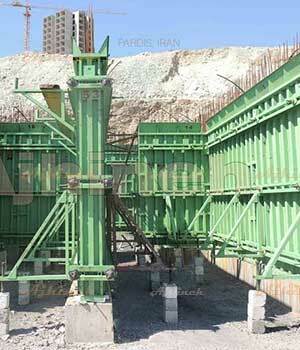 The welded steel formwork is controlled by a steel pipe with a medium clamp in the horizontal and vertical direction. 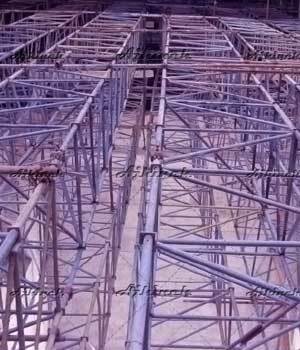 The welded formwork is used to mount any of the required sections, such as a one-sided, two-sided wall, a high wall, an arched wall and a foundation. 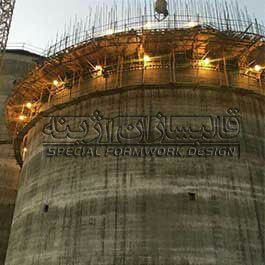 And using a welded formwork, most of the sections that are executed with concrete formwork can be formatted. 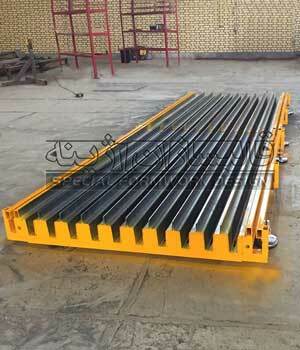 The Table form system is the best solution for implementing the ideal and fast quality roof and slab. 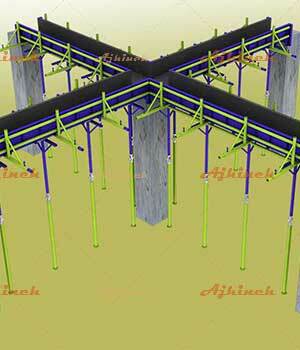 In this method, the formworks will be significantly reduced by the use of wheeled props after concrete installation, so that obstacles such as beams that pass through the table form exit path can be easily transmitted. 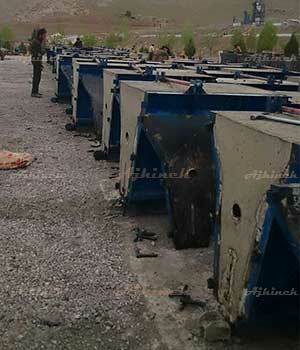 The use of New Jersey Concrete is the predominant part of prefabricated concrete roads in the country. 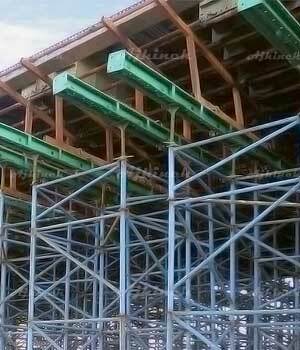 Based on this, different sections of New Jersey concrete with different height and length are produced. 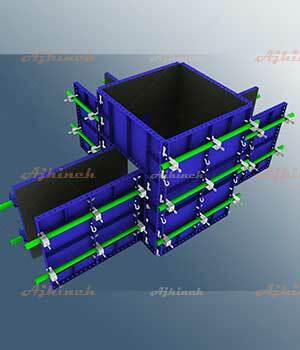 New Jersey formworks produced by Ajhineh are manufactured in two seamless and with seam types. The removing of the seams between the faces sheets in New Jersey formworks increase the quality of New Jersey prefabricated concrete. 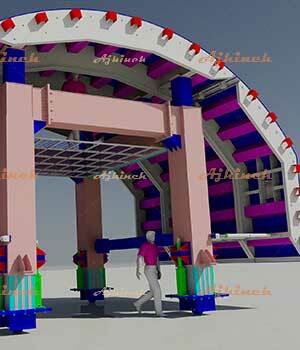 Lining Tunnel System is a hydraulic mechanized system, designed and constructed in a non-mechanized and manual manner on a customer's order in some cases, is the fastest and most accurate way to implement road, water and railway system lining tunnels. 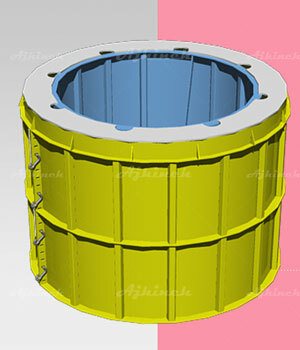 In this system, the shell or facing section is designed and calculated using computational software proportional to the live and dead load pressure. 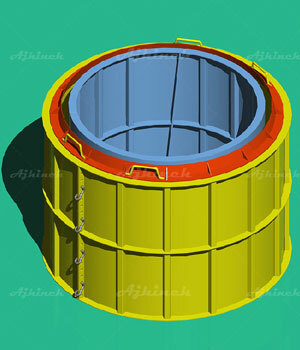 In designing and manufacturing the tunnel lining formworks, the precision and quality of the surfaces are of prime importance, and Ajhineh Engineering team is experienced in the design and construction of numerous projects and technical know-how to prepare the lining tunnel molds. 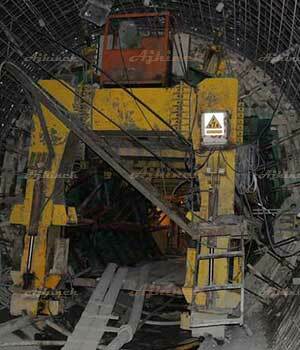 The tunnel form system is used to speed up forming in mass production with minimum working costs. 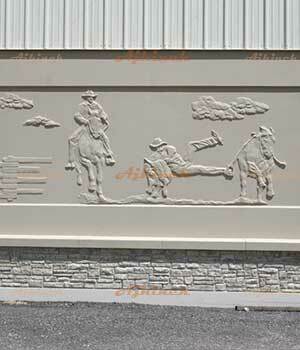 Flat concrete surfaces and high-dimensional precision eliminate toughened layers such as plastering. 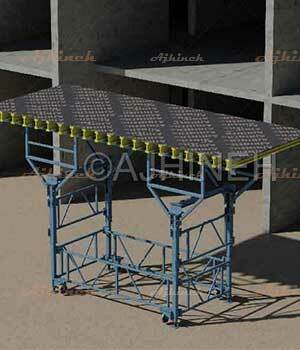 Tunnel Form System for Concreting Buildings that are Resilient to Earthquake Shear Wall Structures. 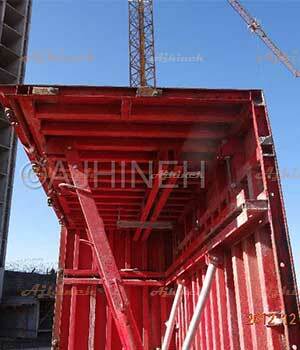 The tunnel form is a system that allows you to fit the walls and ceiling in one single-day process. 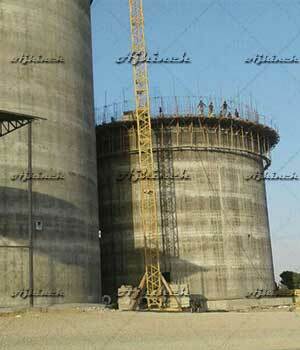 The construction time of this fast system is significantly reduced compared to the usual methods. The Tunnel form System brings you the speed, quality, precision of concrete construction, and provides you with a great deal of savings in the process of work, installation, and electrical work. 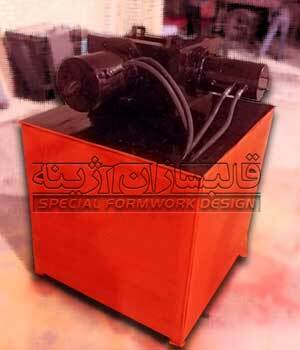 The uses of conventional formworks due to the seams of the joints and not so large dimensions of these formwork is not suitable for the implementation of exposed concrete. 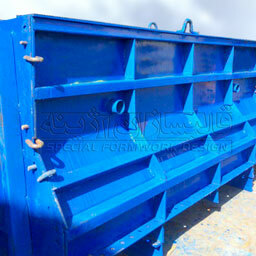 Exposed formworks are larger than conventional formworks and are exclusively designed to remove formwork seams with the removal of neck or nail formworks. 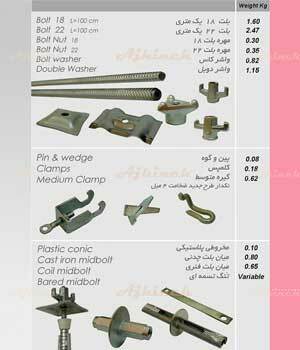 The uses of special steel (ST52 material) for the molding process, the removal of common belts and the use of special interfaces of this kind of formworks, minimizing fittings and formatting features are unique features of the exposing format, which should be adhered to in design. 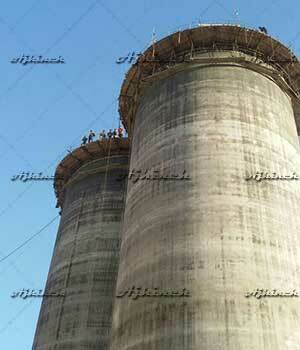 Silos, cooling towers and pylon structures, due to their high height and lack of class support, are among the structures that should be used to make slip forms. 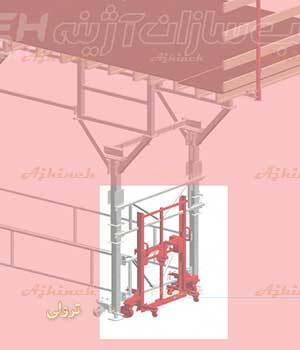 The use of the slider jack, due to the vertical movement on the jack, also known as slip Jack, along with the hydraulic unit, yoke and other accessories, greatly enhances the speed of slip form structures. 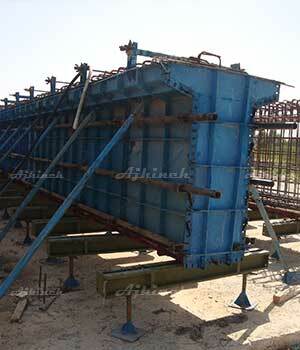 I-Beam formworks are designed and constructed to concreting the concrete beams that are placed on free-way bridges. 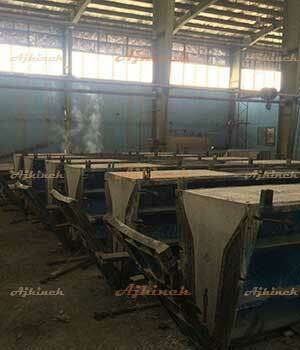 Wall forms, cap forms, floor forms are the main pieces of this mold. Due to the fact that concrete prefabricated bridges should remain at least 20 days at the site where the concrete is to be laid, the most suitable method for the optimal use of this template is the simultaneous use of several floor formworks. 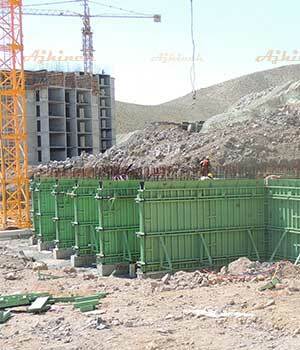 With this method, about two days after the laying of the first bridle, the wall formworks is opened and assembled on the next floor formwork area, conditions for the subsequent concrete concreting are provided. The nano-flex molding is a new product of Ajhineh formwork makers, to pave all facade surfaces and highly flexible elastic surfaces, pave the way for complex and abstract designs. The ability to run in site and prefabricated, implementing urban and construction architectural designs and concepts is one of the unique features of nano-flex. 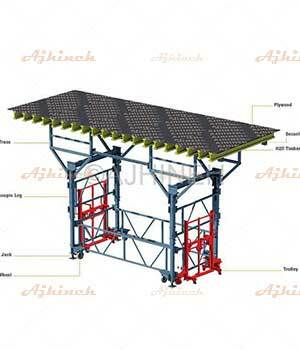 The shoring props are made up of two parts of the stomach and pitch and are used to hold the modular formworks or roof structures. 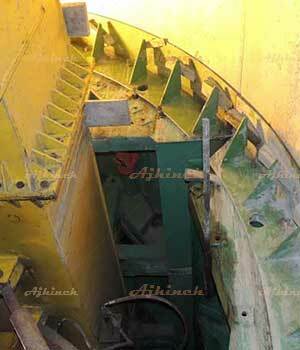 The lower part of the prop is made of pope with 6 cm in diameter and 2 mm in thickness, along with prop's thread. 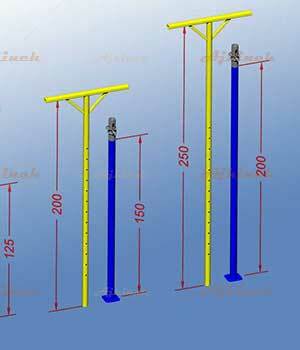 The upper part of the prop is made of a pipe with 5 cm diameter with a thickness of 2.5 mm and in two types of cross head or simple, with the ability to install a installing the movable cross head. The standard height of the prop is 3.20 m and weighs 14 kg. 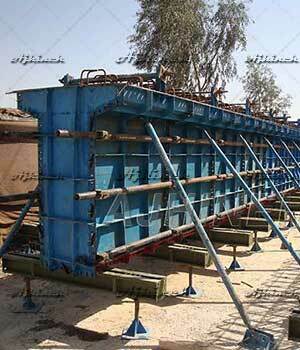 Circular formworks are used to form circular columns. 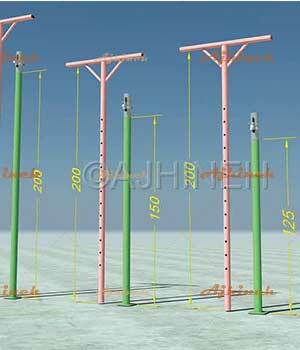 The implementation of piles and columns with rounded sections requires precise formworks to meet the desired radius and diameter of the customer's optimal quality of concrete pillars. 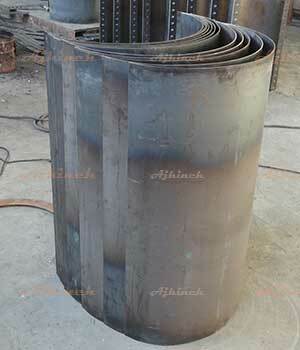 The use of advanced hydraulic rolling machines without fracture of the front and end sheet, as well as the use of precision rolling rods, has increased the accuracy of these molds. 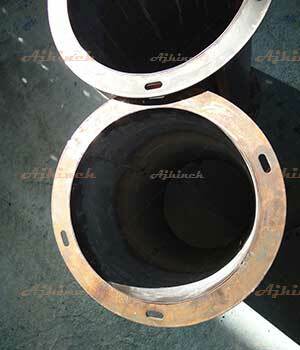 Manhole prefabricated concrete is used to speed up the implementation of sewage networks and ghost channels. 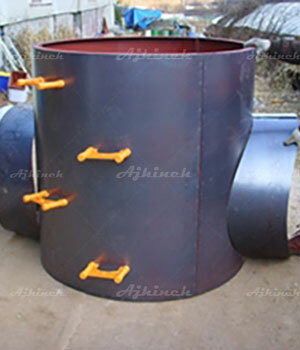 Manhole concrete can be prefabricated or in place by using a manhole formwork with a top and bottom flange as well as an outer round form and a round form. 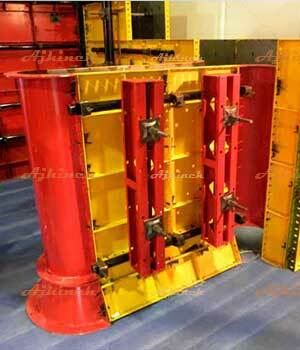 The use of an internal formwork with a triangular or trapezoidal filler speeds up the dampening of formworks. 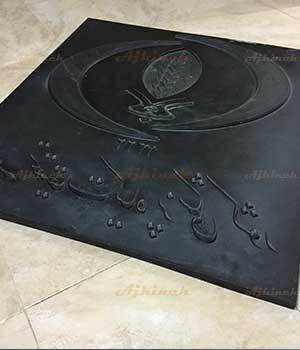 Rolling tiles are produced in high precision projects under precise casting techniques. 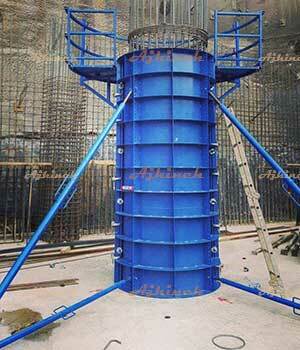 The triangular scaffold is the fastest shoring system for the deck of bridges and high ceilings of buildings. 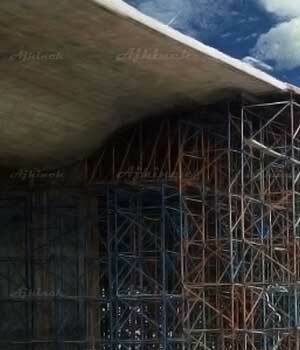 The main part of the scaffold is the triangular scaffold frame. 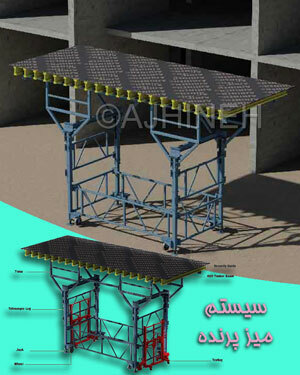 The scaffold system is created by combining four triangular frame arrays with lateral and diagonal intrusion. 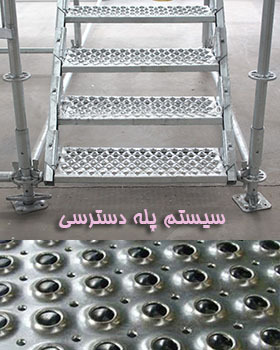 Light weight, ease of assembly and return on investment in second-hand scaffolds are unique features of triangular scaffolds. 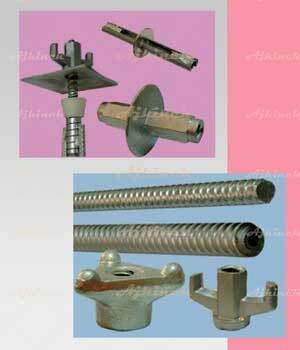 For formworking concrete using modular steel formwork, accessories of formwork should be used. The group has been working with all of the formatting components to make it easier to complete with all the components required by the building contractors in a package.